Nisha's Skill Tree is shown in brief detail by Rev3Games. 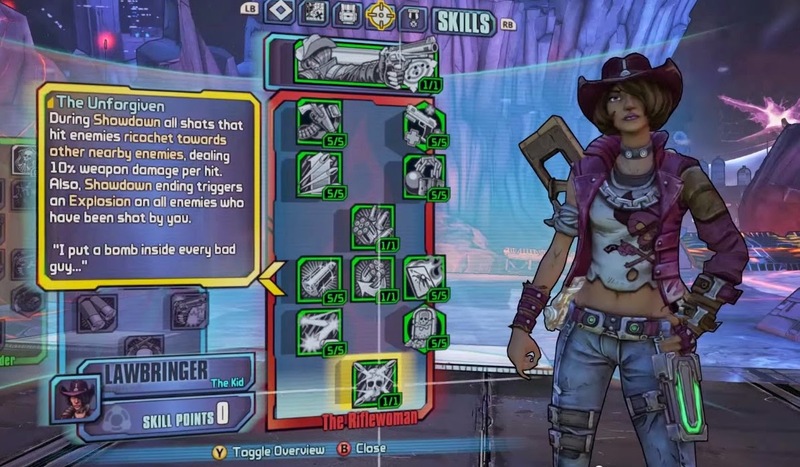 Nisha's Action Skill is called Showdown, which gives her a huge boost in gun-play. No fancy summons or berserk modes here. When Showdown is activated, you will be able to Auto-aim while receiving boosts to Gun Damage, Fire Rate, Reload Speed, Accuracy and Bullet Speed on all gun types except Sniper Rifles and Rocket Launchers. A little boring to be honest, but might be very handy for solo players. One of her Skill Trees will be named Law and Order. Because Nisha's a Sheriff! Law and Order are 2 skills in that Skill Tree as well. 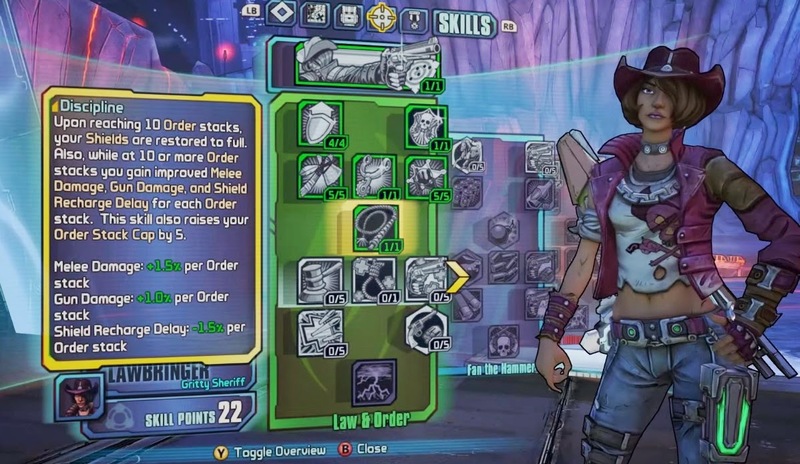 Order is a skill that allows you to gain stacks every time you take 15% of your max health. The higher the no. of stacks, the higher the chance to heal double the damage taken. Law, on the other hand, increases your Shield Capacity and Melee Damage. If you are going with the Order skill, you should also take the Discipline skill to fully benefit from the stacks. Not only does the Order stacks help you with healing, but also with Shield Regeneration. Adding 5 stacks to the total, if you have more than 10 stacks, you will also gain improved Melee Damage, Gun Damage and Shield Recharge Delay. Under the Fan the Hammer Skill Tree, you will see some Kill Skills. One of the coolest Skills in this tree, or all the trees for that matter, is the One for Each of Ya. Basically, this skills duplicates the current Pistol that you are holding, for the other hand. 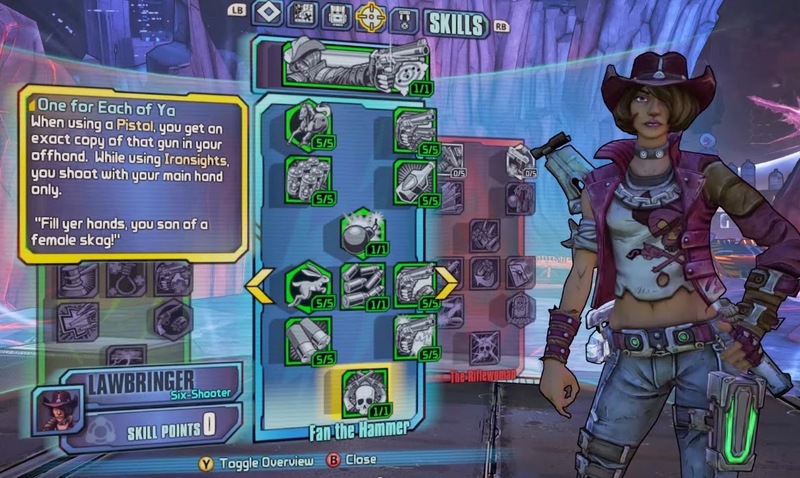 I love the Gunzerker (BL2) and the Berserker (BL) because of their dual-wielding abilities, so I love this skill as well. This will be fun. Lastly, is The Riflewoman Skill Tree. 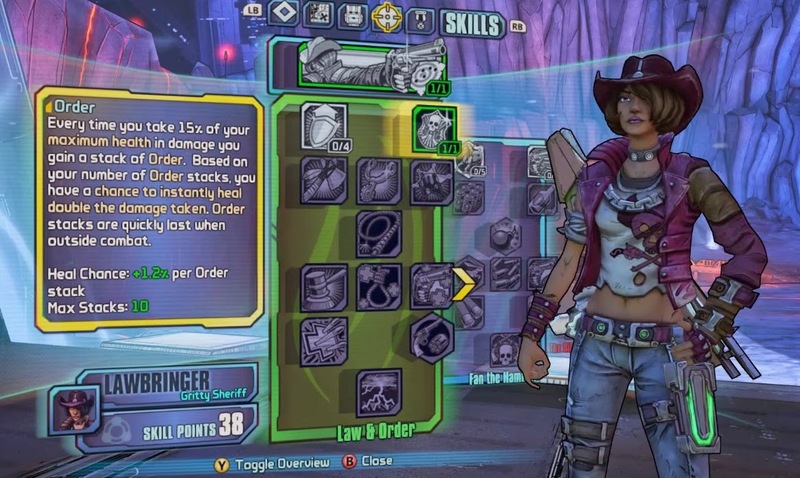 This Skill Tree allows Nisha to 'fire from the hip'. I'm not exactly how this works and the video doesn't really explain much either, but some of the skills here are extremely powerful. One example is The Unforgiven.. This will allow all shots that hit enemies to ricochet during Showdown. And when Showdown ends, all enemies that have been shot will be hit with an explosion. I'm not sure if this includes enemies that have been hit with ricocheted bullets. That will be too awesome if it does! Overall, I don't feel that Nisha's skills are as interesting as Wilhelm's and Athena's. 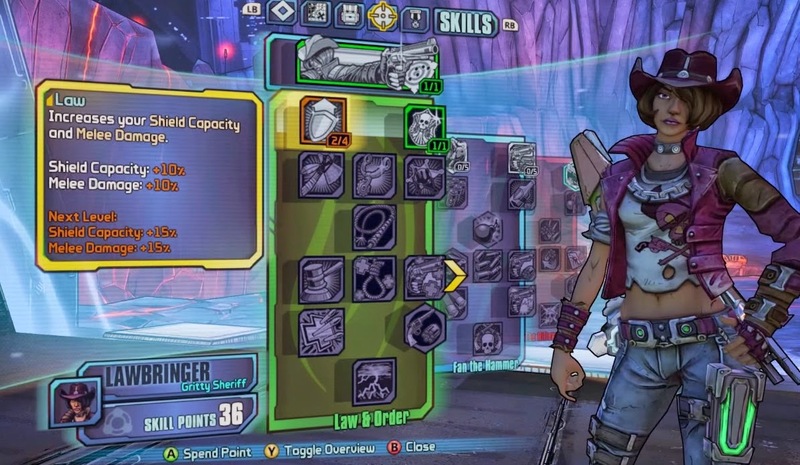 There's not much crazy action but a lot of her skills focus on straight-up gun damage. Which can be a good thing for newer or lesser-skilled players. Sometimes, trying to handle too much can be a little overwhelming. That said.. her ability to dual-wield Pistols is making me lean towards her at this moment. It's too bad that the skill is so far down the Skill Tree. But, who doesn't like a woman with a whip? IGN's Detailed Skill Guide lists down the stats for each Skill Tier. Check out some game-play from Gamespot. and more from Escapist News. 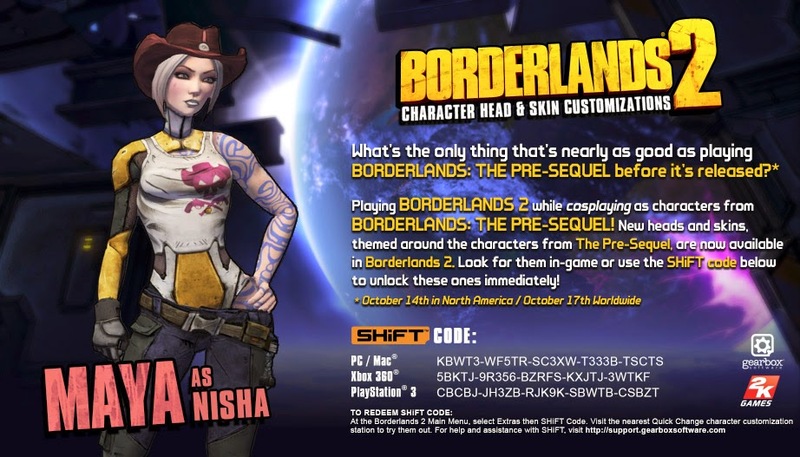 Don't forget to use the Shift Code to get a Nisha cosplay outfit for your Maya in Borderlands 2!